Dazzled in the genius of a band of colours, Revanta Welfare Society the apartments in the city GT Karnal Road, Delhi North, is blazing, adorned with the brilliance of architect each a signature of the owner?s identity, values and tastes. The property is a residential complex by Revanta Welfare Society consists 2BHK, 3BHK and 4 BHK apartments. From the entrance lobby to the car park, from the swimming pool to the landscaped gardens, the complex enthralls. It will hold the occupants and the guests spellbound. Where is Revanta Welfare Society located? G.T Karnal Road, a prime residential locality for house seekers in Delhi North. What is available flat size in Revanta Welfare Society? Flat sizes in the project range from 890.0 sqft to 2100.0 sqft. 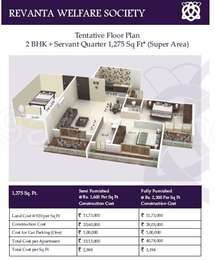 What is the area of 2 bhk in Revanta Welfare Society? The size of a 2BHK unit in the project ranges from 890.0 sqft to 1275.0 sqft. What is the area of 3 bhk in Revanta Welfare Society? 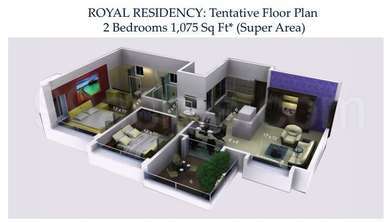 Three-room units (3BHK) in the project are available in an area of 1150.0 sqft to 1775.0 sqft. What is the area of 4 bhk in Revanta Welfare Society? The size of 4BHK units in the project is 2100.0 sqft. What is the area of Revanta Welfare Society?The total area that the project occupies is 82.0 Acres. Revanta Multi State CGHS Ltd. Group has today made a big name in the real estate sector of India?s most investor friendly locality ? Delhi. With a concentrated focus on developing residential space, Revanta Multi State builders has experienced tremendous growth. By following a strict customer centric approach, Revanta Multi State developers has found a very loyal customer base in Delhi. Promising a spacious future to the city, Revanta Multi State constructions has developed a number of projects that are running successfully. They include ? anta Heights, Smart Residency, Kings Court, Suryaa Homes, Royal Town Heights, amongst various others. Apart from these, there are a number of projects that are kept in pipeline. The USPs of all the projects that are developed by Revanta are proximity with all the prime places of Delhi such as Connaught Place, GT Karnal Road, and ISBT. Along with being in strategic location, all the projects boast of modern interiors and amenities aimed at satisfying the needs of the occupants including ? Gymnasium, waiting lounge, swimming pool, etc. Revanta Multi State CGHS Ltd. promises and aims at the timely delivery of spacious living areas at much affordable cost as compared to any other part of the city. I am planing to buy 3 BHK flat in GT Karnal ROAD that will be developed by revanta welfare association. I am little bit confused because construction will start next year and this is done with the joint venture of private builder and dda. they will give possession in 2018. please guide me on this. why not you look in greater noida. Where exactly is Revanta Welfare Society contructed on G.T. Karnal Road because the entire strech is about 2500 km long!!!!! could someone guide me on the exact location of this project?? is there any project or any society developed by revanta groups.